I really prefer Jasper’s Nursery Crimes series (which if you haven’t worked it out by now are fairy tales & nursery rhymes reframed as murder mysteries) more than his more successful Thursday Next books (which began with The Eyre Affair). With these books seems to know where he’s going and there’s less angst to drag them down. The basic concepts are solid. That policing works like mystery novels and TV series (especially, British murder mysteries) and the success detectives is related to the success of the stories and TV shows based on their cases and that fairy tales and the like exist mainly in Berkshire. 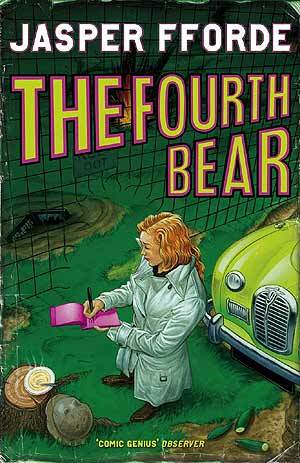 “The Fourth Bear” like all of Fforde’s books does the things they are required to do. They are funny and they work as murder mysteries. The book is full of clues, red herring and side adventures and some of the foreshadowing is highlighted a little too much but it all come together in a tight little denouement. The books in the series walk gleefully into the standard murder mystery tropes, often announcing them or dismissing various “plot types” that their following. The meta-fictional fun of the setting, with characters aware of the murder mystery stories and the fairy tale nature of their universe, is great. I’m a great lover of meta-fiction. However, the story does go beyond plain meta-fiction into breaking the fourth wall a little too often, and even being to acknowledge the fact. It gets to the point where the author is no longer winking at the audience but rather has one eye permanently closed. As happens in murder mysteries all of the success and goodwill the characters had in the previous bo0k is quickly got rid off both in a prologue incident and others referred to that occurred between novels. It’s necessary to mimic the genre, but it is as annoying for the read here as it is in series crime novels. All that said, “The Fourth Bear” is a fun ride in a car supplied by the car lot of Dorian Gray. I’ve never been a fan of the murder mystery genre. I’ve read a few and just find them frustrating, not terribly enjoyable. I think I could find Ford’s fusion of fairy-tales with the genre more enjoyable than not but that still doesn’t mean I’d find them irresistibly so. I enjoyed the Thursday Next novels well enough but, for my money, I think I’d prefer reading Terry Pratchett because he always makes me laugh. Never been a big reader (or watcher) of mystery beyond Agatha Christie. Yeah, it’s only as good as the genre and Pratchett is better. I found Thursday Next a bit more depressing then these.